We sit down with Jim Bennett, son of former Utah Senator Bob Bennett, to discuss Jim’s response to the CES Letter. This interview takes place over several different days and comprises looking at the troublesome issues the CES Letter presents and reviewing where Jeremy Runnells and Jim Bennett disagree. I try to play a mediator between Jim and the ideas of the CES letter. Granting ground where I think Jim offers a reasonable response as well as pushing back where I think the CES Letter presents a credible case. 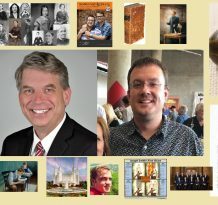 In part 2 we tackle other issues in the Book of Mormon including the presence of 19th century material in all of Joseph translation productions, the 11 witnesses, and anachronisms. We then start to get into the Book of Abraham and touch on ideas like Prophetic fallibility and Spiritual witness, topics we hope to dive into deeper as we continue the conversation.